Danielle and Alex were truly one of the sweetest couples to work with, and their wedding was pure magic filled with Llamas, love and the most elegant aesthetic brought to us by the expertise of Sincerely Ginger Weddings. This adorable power couple resides in Manhattan, New York where they are both lawyers, showing equal amounts of devotion for their relationship and careers. Alex and Danielle wanted a clean and classic look for their wedding, but they didn't stop short on implementing fun details and timeless elegance. We had so much fun creating a wedding suite for them that incorporated all of these details. For this stationery we combined bubbly letterpress calligraphy, digitally-printed custom watercolor art, and a custom map featuring the cutest llamas you ever did see! One of the coolest aspects of creating this suite was having the opportunity to work with another artist. The gorgeous custom crest was designed by artist Paige Smith Spearin, who paints for Lilly Pulitzer! It was so fun (and such an honor) to incorporate details to this suite that perfectly paired with the elegant crest created by Paige. I have to say, I think my all time favorite detail of this suite goes to the custom letterpress map featuring kissing llama's. Simply adorable! I also can't forget to give a shout out to the tiny watercolor meal choices on the RSVP cards. The couple's customized details from the invitation suite carried over to multiple day-of pieces as well. These pieces included personalized champagne bottles, ceremony programs, table numbers, place cards and menus. We love seeing all the ways our couples apply these designs throughout their big day, making it so personal! And don't worry, those adorable illustrations from the RSVP cards made it to the party too; each guest had an animal or plant on their place card based on their meal selection. So creative and such a fun design feature! By now, I am sure you are all noticing the pure magic we are talking about! 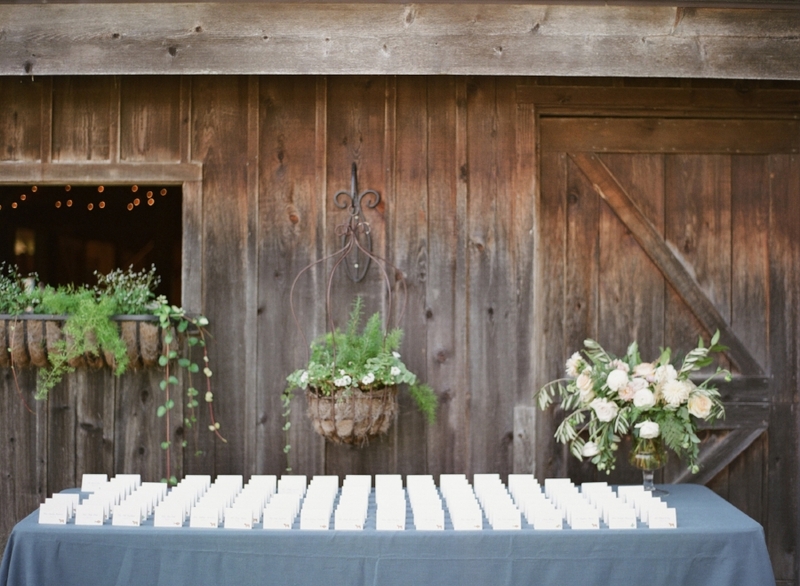 Snow Moon Ranch creates such a timeless aesthetic, gorgeous backdrop of scenery (and has adorable llamas that every guest will fall in love with) making it one of our all time favorite venues to see our clients enjoy. Combining this venue with some of the best vendors in the business like Bloom Floral Design, Sincerely Ginger Weddings and Cory Weber Photography made for a team of wedding perfection, we feel so luck to have been a part of! Every detail of Danielle and Alex's wedding came together so perfectly to create their clean and elegant vision. This classy celebration of love was surely one for the books. Nothing beats an outdoor sailcloth-tent wedding in Northern Michigan, and adding llamas to the mix only magnifies its perfection. Congrats to the happy couple. We are so grateful to have made all your stationery dreams come true! Mark and Mallary tied the knot last summer in gorgeous Simi Valley, California. We felt so lucky to be a part of their big day by creating such lovely stationery filled with hand-painted details. Everything about this suite screamed custom! We started with save the dates, featuring a totally dreamy engagement photo, which really set the tone for the rest of the stationery and their wedding as a whole. Their invitation suite displayed rich watercolor florals, flowing watercolor calligraphy, and a custom wedding crest to perfectly compliment their earthy California vibe. Custom crests are one of our specialty custom pieces that make a timeless addition to clients' wedding stationery. Mark and Mallary incorporated their hand-painted wedding crest into many of their day-of details, including handkerchiefs, cocktail napkins, and the guest book. These beautiful pieces added the couple's unique stamp to many aspects of their wedding that are often otherwise overlooked. The wedding crest is a timeless piece of art and personal touch that couples can cherish for years to come, and we feel honored to create such a special piece for our clients. The earthy hues, unique details and genuine love these two have for each other is what truly made this wedding stand out. I am so grateful we could be apart of making their day one-of-a-kind with each Sable & Gray detail! All the best wishes for a life of love and happiness to this gorgeous couple. Thank you Nicole to Nicole Leever Photography for the stunning photos!